Disclosure: I was sent a copy of this movie from the vendor in order to write up an honest review. The views shared are mine and mine alone. "It’s a night of epic proportions filled with imagination, caring, learning, singing and dancing when Barney®: 3–Movie Pack roared onto DVD October 15, 2013 from Lionsgate and HIT Entertainment. This super-dee-duper collection of three feature length movies will fill the hearts of young ones as they enter the land of make believe, have fun making music and celebrate the biggest event of the year – Christmas. 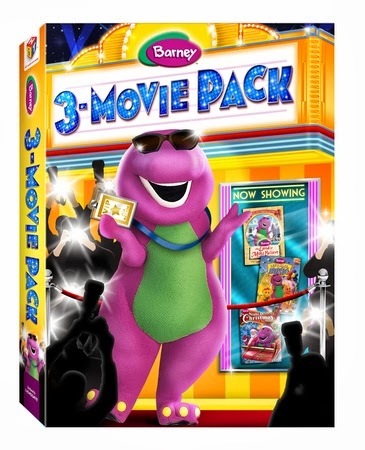 The Barney®: 3–Movie Pack DVD is available for an incredible low price of $19.98. It’s a memorable Christmas Eve as Barney, BJ and Baby Bop take their friends on a musical journey to the North Pole and bring them face to face with Santa Claus! The excitement builds as Santa gives his guests a once-in-a-lifetime tour of his brightly decorated home. The children discover his antique music box, see amazing displays of his favorite toys and climb aboard his train for an incredible ride. When Mrs. Claus notices that the elves need help finishing up last minute Christmas chores, she escorts the group to Santa’s Toy Factory. Join BJ, Baby Bop and the children as they wait patiently to hear the sound of sleigh bells and share in the most magical night of the year with Barney!" I love it when the folks at Lionsgate Home Entertainment and HIT Entertainment put out 3-DVD Sets of some of today's favorite children's television series. Just the other day, I shared a review with you on the recent Thomas & Friends 3-DVD Set. 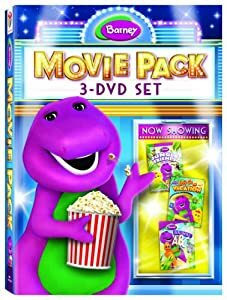 Now, today, I wanted to share more about this new Barney 3-DVD, as well as offer one lucky reader a chance to win this DVD set for their Barney fan. Either you like Barney or you don't? But, kids all over the world can't get enough of the big, purple dinosaur. One of the first songs my girls both learned to sing word for word was the infamous "I Love You" song from Barney. And, next to Mickey Mouse, they were able to point out Barney by name, as young as 1 yr. old. Barney is all about sharing, friendship and caring, and each and every episode will have you and your little one dancing and singing along, as Barney comes to life and spends the day learning alongside his real-life friends. This 3-DVD set couldn't have come at a better time, as it celebrates everything Christmas in the full-length movie, "Barney: Night Before Christmas -- The Movie," as well as doing what Barney does best, entertaining little ones through imaginative play and fun in the other 2 DVDs that make up this 3-DVD. Each DVD includes additional bonus features, which include games, music video and even read-alongs. Just the other day, we watched the Christmas DVD from this Barney DVD set, and followed up with listening and singing along to the five Christmas songs found in the bonus features section. Overall, this 3-DVD set is a great value at the suggested retail price of only $19.98. For this price, you can pick up an extra copy to leave at the grandparents house, or for the car. One lucky reader will win a copy of this new 3-DVD set to share with that special Barney fan in their lives, thanks to the folks at Lionsgate Home Entertainment and HIT Entertainment. To enter, please complete the entries on the Rafflecopter form below. Good luck!